Joseph R. Rossetti received his undergraduate degree from Fairfield University in 2006 and his law degree from Quinnipiac University School of Law in 2009. He is licensed to practice law in Connecticut Superior Court, U.S. District Court for the District of Connecticut, and Mashantucket Pequot Tribal Court. His practice is limited to the representation of injured persons and their families. Joseph primarily handles motor vehicle collisions, premises liability cases, and product liability. He likes to focus his work on cases involving complicated medical causation and those with multiple expert witnesses. Joseph was one of the youngest (if not the youngest) Board Certified Civil Trial Advocate in the State of Connecticut. This honor was achieved through trial work, credentials, and examination in November, 2016. 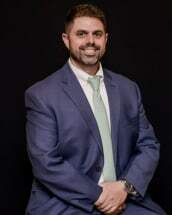 He has also been recognized as a New Leader of the Law by the Connecticut Law Tribune, A Super Lawyers Rising Star for multiple years, and a Top 40 Under 40 Advocate by the National Trial Lawyers. Joseph He has successfully tried numerous cases to verdict; both bench and jury. He recently achieved a 1.4 million dollar verdict on a contested liability case in the Judicial District of Waterbury. The pretrial offer was $10,000. This is just one of the many cases where the final outcome for his clients has been far in excess of the last "best offer". Joseph worked and volunteered at Bridgeport Hospital's Radiology Department for nearly a decade prior to becoming a lawyer. During his time there, Joseph gained valuable medical experience while witnessing, first hand, the pain and suffering that can result from the negligence of others. Joseph also served as a licensed Emergency Medical Technician. From this, he brings a unique perspective to all personal injury cases. His medical background has been particularly beneficial in cases involving complex medicine and/or difficult causation. He had also served as an instructor/coach for the Quinnipiac University School of Law Mock Trial Honor Society for over five years. There, he mentored future lawyers on all aspects of trial preparation and presentation.